The Busy Woman's Guide to Murder won the Romantic Times award for best amateur sleuth! CHARLOTTE ADAMS is not quite five feet tall, addicted to stiletto heels and chocolate. She loves her business as a professional organizer in a small town in upstate New York, close enough to the money, far enough from the miserable ex-fiance. Things should be going well for her in this pleasant spot, surrounded by old friends, new dogs and plenty of clients. Too bad that if you're an organizer, you know everything about the homes you de-clutter. Every now and then you just might turn up a real skeleton in one of those crowded closets. Charlotte's not looking to play sleuth, but she's tenacious enough to hunt for a murderer if that's what it says on her to-do list. 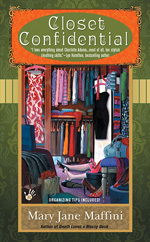 The Charlotte Adams mysteries come with organizing tips. You can use 'em or lose 'em. It's up to you! 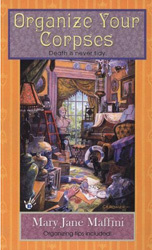 All the Charlotte Adams mysteries are available in print and your favorite e-book version. When thirty-year-old Charlotte Adams returns home to set up her personal organizing business in the historic town of Woodbridge, New York, she's expecting to find clients who need professional help sorting out their clutter, collections and just plain junk. She's expecting to reconnect with her old school friends, the lovable misfits: Sally, Margaret and Jack. She's expecting that her two rescued miniature dachshunds will help her forget her lying, cheating ex-fiancé and the square-cut diamond she's just tossed into the Hudson. She's not expecting to find her first client dead in the debris of a historic home. Not even a little bit. The death of the tyrannical retired teacher Helen "Hellfire" Henley makes the news in a big way. That's got to be bad for business. Naturally things get worse when the police find Charlotte's pen under the body. This is particularly tricky since Charlotte's former friend and current nemesis, Sgt. Pepper Monahan is in charge of the investigation. Try organizing your way out of that, lady. And for you? Organizing tips included. 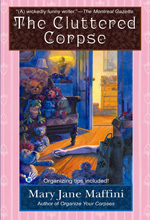 The Cluttered Corpse is the second book in the Charlotte Adams series. When Charlotte Adams agrees to help Emmy Lou Rheinbeck organize her embarrassingly out of control stuffed animal collection, she never imagines she'll find herself fending off pranksters whose shenanigans lead to murder. Luckily, she has the support of her misfit friends Jack, Margaret and Sally. Sgt. Pepper Monahan is still in an unforgiving frame of mind, but Truffle and Sweet Marie earn their kibble by the end. Okay, they're still not perfect, but darn it, they're cute. The organizing tips may help you tame your own collections. Recent murders have unbalanced professional organizer Charlotte's life and ruined her favorite footwear. The new fuchsia and red wedge heels cheer her up briefly, but now her messy-desk client is missing, bodies are turning up in Woodbridge, and the police are strangely tight-lipped. 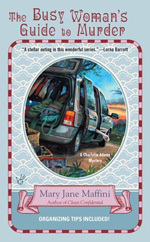 Worse, her close friend Margaret appears to be dating a mystery man on the sly and even her buddy and landlord Jack Reilly has someone in his life: a woman with an agenda that does not include Charlotte. On the home front Truffle and Sweet Marie seem destined to fail therapy dog training. As the body count rises, there may not be enough Ben & Jerry's New York Super Fudge Chunk in the world to get Charlotte through this. Organizing tips included. "There is humor, charm and organizing tips which makes for a fun read." Romantic Times Four Stars! When an old family friend hires Charlotte to organize his famous wife's seven bulging closets, Charlotte is shocked to learn that the closets are only the surface issue. Wealthy, spoiled and famous Lorelei Beauchamp wants Charlotte to find who murdered her daughter. Of course, that death has been ruled an accident and Charlotte resists. But soon she finds herself in a dangerous sleuthing game. Pepper Monahan, usually an arch foe, leans on Charlotte in an unexpected way. Is Nick the Stick the worst husband in the world? More organizing tips! Mona Pringle, the 911 operator, is calling organizer sleuth Charlotte Adams for a change. Her high school tormentors are back in town and Mona is muttering about revenge. When the bullies start turning up dead, Mona goes on the run, with Charlotte desperately scrambling to save Mona from herself and prevent more deaths. In the end, it's surprising whose life is on the line. Meanwhile, Truffle and Sweet Marie face the challenge of their third attempt to become Therapy Dogs. Three strikes and you're out, pooches. Better try hard. Organizing tips included, of course. Daisy and Lily Maffini would like to state unequivocably that (despite surface ressemblance) there is no connection whatsoever between them and Charlotte Adams's dogs, Truffle and Sweet Marie. Daisy and Lily would never hide keys, unfurl toilet paper, or dash off while their owner was being pursued by the police. They are pretty sure that they would do much better with their Therapy Dog Training than their fictional counterparts. As for that other stuff: the matter of the missing slippers and the gnawed dining room chair leg can be attributed to youthful indescretions. And as for those PC chargers, shoot happens. If you have a problem with that, have your people call their people.